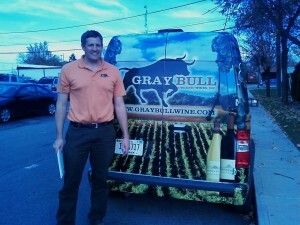 Just back from a midwestern sales trip, where I was happy to work with our IN distributor Derek Gray of GrayBull Organic Wines. He’s done a great job opening up a small specialized wine distribution company serving the Indianapolis area. We visited a number of stores and restaurants together. I arrived during a wine tasting Derek led at MassAveWine.com on Mass Ave near downtown. This is a wonderful shop selling wine by the glass with Jill’s delicious sandwiches and appetizers. You can also buy a bottle to take home after you find one you like. It is a great combination that I wish could happen in every state, but laws prohibit mixing sales in many states, including our wonderful Maine! I was again struck by how much sugar and fat appears in almost everything I order when on the road. It’s too bad that so many Americans end up eating such a diet. A little red wine daily might stimulate our appetite for healthy food with less sweets & fats!